TUFF SHED, Inc., America’s leading supplier of storage buildings and garages, is primed for the start of a busy spring season servicing customers in the Houston market at a new location. To better serve customers in South Texas, the Houston TUFF SHED locations have relocated in order to improve customer convenience and accessibility. Now located at 7935 Wright Road, off of Highway 290 between Jones Road and West Road, the new TUFF SHED location is a retail sales site that features a broad range of display models. TUFF SHED's Premier PRO Ranch is their best selling model with Houston customers. TUFF SHED, Inc., America’s leading supplier of storage buildings and garages, is primed for the start of a busy spring season servicing customers in the Houston market at a new location. To better serve customers in South Texas, the Houston TUFF SHED locations have relocated in order to improve customer convenience and accessibility. Now located at 7935 Wright Road, off of Highway 290 between Jones Road and West Road, the new TUFF SHED location is a retail sales site that features a broad range of display models. Positioned just off of the Frontage Road, this location is in a much more accessible area, as customers will no longer have to pass through the tollway in order to visit the location. The store can be contacted by dialing 713-896-8110 or toll-free at 1-800-BUY-TUFF. Building sales consultants are available at this location Monday through Friday from 9 a.m. to 5:30 p.m. and on Saturday from 9 a.m. to 5 p.m. In addition to the new location of the TUFF SHED retail sales site, the Houston TUFF SHED manufacturing facility has also been moved. The new factory is a 20,000 square foot facility located at 3901 Airline Drive, and will be the production hub for TUFF SHED buildings in the Houston area. The new location is expected to help increase production capacity for TUFF SHED, which manufactured and installed more than 1,400 buildings for local customers in 2011. The Houston store on Wright Road, which is in full operation and open to customers now, is one of twelve TUFF SHED locations in Texas. TUFF SHED factory-direct products include their original solid wood backyard storage shed, larger commercial storage buildings, garages and cabin shells. TUFF SHED provides customers with options to fit every need and budget by offering three different lines of buildings that can be customized to accommodate different customers' needs. Founded in 1981, TUFF SHED is based in Denver, Colorado, and has 43 company-owned manufacturing facilities and roughly 800 employees providing local service to customers around the country. The company has a longstanding tradition of providing premium products and outstanding customer service. All TUFF SHED buildings include on-site delivery and installation, plus industry-leading warranty coverage. 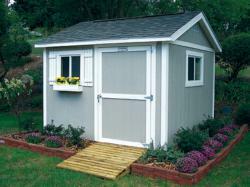 To view an assortment of innovatively engineered TUFF SHED buildings, visit http://www.tuffshed.com.